Sunlight – Most hydrangeas will do best in morning sun/afternoon shade, or filtered sun, especially for flowering. Some will perform in full sun. Planting– Plant your hydrangeas using the same soil from the hole, but lightly amending with compost, pine soil conditioner, etc. Be sure to mulch over the root system of the hydrangeas to keep those roots cool, help preserve good soil moisture, and add organic matter back to the soil. Water– Hydrangeas prefer good even moisture with well-drained and loamy soils. IMPORTANT: Make sure not to over water. Fertilizer– Besides adding soil pH adjusters / adding aluminum if needed, a mid to late spring feeding with an all-purpose fertilizer works for most hydrangeas, or by adding a slow-release fertilizer in the spring such as Osmocote. A light fall feeding after leaves fall is okay as well. Do not overfeed your hydrangeas. Transplanting– Transplant your hydrangeas during the dormant season. New plantings can be done anytime during the growing season. Color– Hydrangea flowers (whites, whites to pinks, pinks, blues, reds, etc.) will range in intensity due to many reasons (variety, weather conditions, plant’s health, etc.). 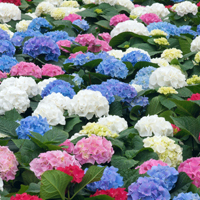 For those macrophylla / Serrata hydrangeas that flower pink or blue, pink flowers are in alkaline soils and blue in acidic soils. Sprinkling lime around the plant seasonally will increase alkalinity (upper 6 and into 7pH), and reduce the availability of aluminum (which causes blue flowers). Adding aluminum sulfate, soil sulfur, cottonseed meal, coffee grounds, Hollytone, etc., throughout the season will help to lower the pH to low 6. Adding aluminum sulfate helps lower pH and adds aluminum, but be careful using it. Water well in advance of adding aluminum sulfate, and use it sparingly and over multiple applications, not just once. During hot days, newly planted and established hydrangeas will sometimes wilt. If it wilts during the heat of the day but recovers by late evening or in the morning, it means it can’t take up enough water to replenish what is lost during the day. It typically stops as the season progresses. Be sure the soil has good even moisture, but do not over water. Hydrangeas do not typically require regular pruning. Most will do fine with nothing more than ‘deadheading’ and ‘dead wooding’ as needed. Be sure to choose hydrangeas that fit the space with their natural growing size. If your hydrangea requires pruning, when to prune depends on your type of hydrangea. Blooms: Blooms on new wood. These hydrangeas are typically June-August bloomers and produce their flowers on the tips of current season’s growth. Pruning/Deadheading: Early spring as they flower on new growth in late fall or winter or early spring as they flower on new growth. At the beginning of spring, it can be cut back to 12” above ground if revitalization is needed. Deadhead spent flowers (just below the flower head) as needed. Prefers: Partial sun to partial shade. Blooms: Bloom on new growth. Typically blooms mid-summer into September. Prune: In late fall, late winter, or early spring as they flower on new growth (can be cut back close to the ground if desired). Deadhead spent flowers (remove just below the flower) as you see fit. Be cautious leaving spent flowers late in the season as non-removed spent flowers can become heavy with rain and snow and cause branches to bend and break. Prefers: Full sun to partial shade. Blooms: Bloom on old wood and newer selections bloom on old & new wood. Typically early to mid-summer bloomers (some turning blue if acidic soils, pink if alkaline soils, and some are white). This group gets a little trickier, for most varieties the flower buds form on the previous year’s growth. Pruning/Deadheading: Only deadhead spent flowers during the season is needed. Actual stem pruning should be completed by early July to allow next year’s flower buds to ‘set’ on the current growth. Many of these hydrangeas are known for ‘not’ flowering or inconsistent flowering, as the flower buds (or stems with the flower buds) are often damaged over the winter. The plant re-grows (usually from the ground or lower stems) the following year with excellent foliage, but very few or no flowers. If the stems die over the winter, they are pruned back for spring cleanup, removing the flower buds as well (which were dead anyway). In the spring, if there is dieback, cut back dead stems until healthy buds are found. In many cases, the stems are removed at ground level, and new growth appears from the roots. Pruning: It doesn’t matter if you prune at the wrong time, or it dies back in the winter, you’ll still get summer flowers. Stems from the previous year will flower earlier the following season.If complete dieback occurs, it will take longer in the season for flowers to form. Deadhead as needed and have any stem pruning (if needed) finished by early July. Deadheading can take place anytime during the year (only removing the spent flower). Blooms: Bloom on old wood. This species (Oakleaf) typically flowers late May, June, early July, but the flowers persist all season long. Pruning/Deadheading: Deadhead the spent flowers (just below the flower) when the flowers are no longer attractive, and if needed, have stem pruning done by early July, as the flowers are produced on the previous year’s growth. If heavy pruning is done, the terminal buds are removed later in the summer or fall, or lost during the winter, or late freeze in the spring, little or no flowers will be produced the following season. If constructive pruning is needed, prune after flowering – being the coarseness of the plant, prune to encourage proper framework early in the plant’s life (sacrifice early flowers), then worry about pruning times for flowering later on. If these get leggy and require severe pruning (rejuvenation), the plant will respond quite nicely to a large cut back in the spring (sacrificing the flowers for the season). Blooms: Blooms on old wood. This vining Hydrangea, which is a beautiful flowering woody vine that attaches itself to grow on trellises, fences, etc. and can even be used as a groundcover or pruned as a shrub. It is usually slow to establish and to begin flowering. The slightly fragrant lace-cap flowers appear late June / early July on previous year’s growth. Prune: Prune after flowering (constructive pruning or deadheading spent flowers). Early spring pruning would include removing deadwood, damaged branches, or light constructive pruning. Like the Oakleaf hydrangeas, any major pruning will result in fewer flowers the following season. Pruning of hydrangeas for flower production can be a series of trial and errors. If you’re still unsure, just follow the basics; deadhead (remove the spent flowers only) as needed, prune any deadwood in the spring. If you still have questions, contact our horticulturalists at questions@natorp.com.